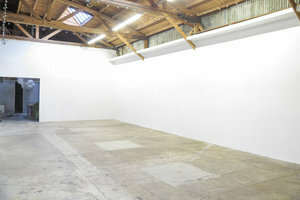 This unique space is advantageously located in the heart of the Arts District of downtown LA. 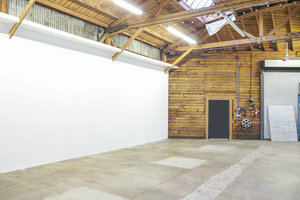 It is perfect for an Art Opening, Private Sale or Photoshoot. 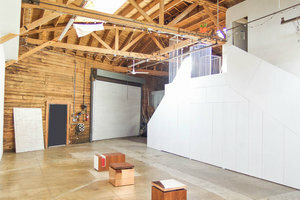 The space is composed of a beautiful white wall gallery space with sandblasted bow truss roof that adjoins a living/dining room filled with custom furniture and artwork. With a skylight as well as track and string lighting, this space has a luminous atmosphere. It also offers basic facilities including a kitchen, furniture and internet and is happy to help accommodate your event needs. Situated in the bustling downtown there is no shortage of amenities within walking distance. 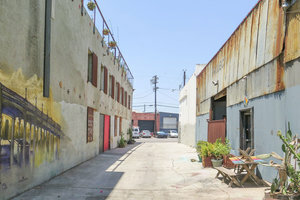 While the entrance is located in an alley, there is ample foot traffic, especially on the weekends as people explore the neighborhood. It is a great option to connect with customers for an unforgettable event.